Building a capable testing enterprise require all elements of Process, Technology, People and Governance to work not only in a synergy but to do better than the competition. The elements need continuous improvement internally and an equal awareness of best practices in the outside world. The intention is to always build a “Competitive Advantage”, that happens with not one element but all elements working together. Given the current business scenario and strive to improve, QAI supports in understanding the current state and the future state of the organization, existing gaps and how the same can be improved upon. The objective is to enhance productivity, quality, improve capability and hence reduce the overall cost of all software engineering activities. We enable the improvement through collective experience, knowledge and expertise of the consultants and through collaborative industry practices. Executing software projects successfully and building high–quality products requires software professionals to understand the unique characteristics of software and the approach used for engineering and demonstrating quality. This requires a well–defined process to build and validate the software. Over the last decade, however, testing and related disciplines have grown as a competency and still continue to grow in multiple dimensions. Emerging Technology Platforms, increasing complexity, highly demanding customers, and complex skills entails that test organizations are no longer those ‘anyone can do’ models. Each project variety involves unique delivery processes. As such, Sizing each project variety also requires customized measurement methods. QAI believes in providing a total estimation solution to its clients. It would normally not suffice if the project managers are simply “trained” on estimation methods. 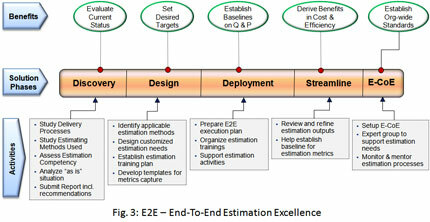 The End-to-End Estimation Excellence solution offering provides a holistic solution to all the estimation related needs from concept to commissioning, from incubation to realization. Provide off-line support in resolving estimation related issues/concerns. And finally, once the client organization has fully deployed the estimation processes, help the IT Unit to setup its own “Estimation Centre of Excellence” through which the client could be self sufficient in continuously refining estimation processes as well as taking up any futuristic challenges in the estimation front.